Since establishing a preferred supplier status with China-based IHC Merwede, Cat engines have powered dozens of dredgers supplied for the Chinese dredging market. Five Cat engines will now power one of the most powerful cutter suction dredgers to operate in the Bohai Bay in Northern China. Commissioned by Tianjin Shunhang in November 2009, the new IHC 8527MP dredger will be powered by 2x Cat C280-12 (3700 bkW @ 1000rpm) engines to drive the in-board main dredge pump and 3x Cat 3516B (1717 bkW @ 1500 rpm) auxiliary engines to provide electric power. Both the high-speed Cat 3500B series and the medium-speed Cat C280 series use electronic engine control to perfectly balance power, fuel economy and engine emissions. 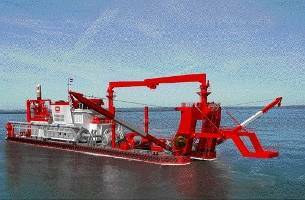 As the growth of dredging activity in China continues increase the investment in dredgers, so has the customer demands for more power and more output. The latest evolution of the IHC Merwede dredgers, the 8527MP, now has a dredging capacity of 15,000 cubic meters to provide a high level of productivity, reliability and ease of operation. This design is based on a suction diameter of 85 centimeters (33 inches) and can cope with dredging depths up to 27 meters (88 feet). Eight additional 8527MP dredgers were sold at the 2009 Marintec China exhibition, all powered by Cat engines. For the Shunhang application, nearly all the engines have been supplied in a tailor-made package from WesTrac to facilitate customization to meet ship building requirements.